This was a momentous year for Formula One, what with the world championship being decided in the final sector of the final lap of the season's final race, and the genuine peace which broke out between the sport's two grandee teams Ferrari and McLaren. 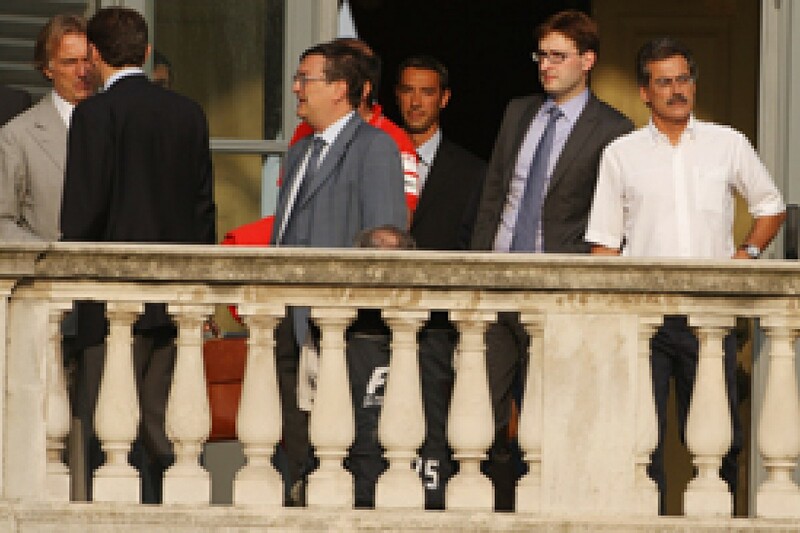 - The formation and effects of the Formula One Teams' Association. In fact, so long-running have these topics been that autosport.comcom's news listing over the past week or two could easily have provided the index for the Weekly Grapevine (2008 Vintage), what with most stories effectively expanding on this column's primary features during the year. Early on in the year, the column mused about the possible departure of one or more teams from the sport, particularly given that no Concorde Agreement existed to bind them to Formula One. Yes, a Memorandum of Understanding signed in 2006 existed, but, as the WGV pointed out back in December 2006 (when it correctly prophesied that it was increasingly unlikely that any form of tripartite agreement would be entered into by the sport's trilogy of players), the teams had entered for 2008 only, so could withdraw at any stage. In January this column correctly suggested a Japanese team could do a runner; it was incorrect, though, in suggesting it would be Toyota. However, shortly thereafter this column ran through the polar differences between the modus operandi of said team and that of Honda, concluding that in 2008 the 'stakes could not be higher' for the two teams. And so, for one of them, it turned out. The lack, though, of any legal action by the Formula One Group (or, for that matter, the FIA) indicates that any team (bar Ferrari, for reasons which will become evident) could exit the sport overnight. To paraphrase Pete Townsend and his band of rockers: Who's Next? During the official test session at Jerez in January we interviewed a leading technical director who spoke about KERS on account of anonymity, and he kicked off by expressing his concerns for the safety aspects of KERS - regardless of whether teams chose electric or mechanical solutions. Of secondary concern to this well-respected engineer, whose teams have won championships, was the expense - he put costs of developing KERS 'at between 20 and 60 million (dollars)' - at a time when the FIA was increasingly calling for cost-cutting. He also disclosed that the preferred energy storage choice, namely lithium batteries which produced arsenic as they ran down, was hardly the greenest choice. During the Canadian Grand Prix, an interview with Ross Brawn revealed a case for not running KERS at all on the basis of complexity and weight, and for the first time a host of media outlets cottoned on to the fact that KERS was optional - and that going with batteries could cost up to $250 000 per car, per race! Would Honda be spending $9m (about 10 per cent of the sort of overall budgets suggested by the FIA) on batteries in 2009? Brawn preferred not to answer that one. During the year this column brought a host of exclusives, with one, to wit the OWG's studies and how racing would be affected by the adoption by the FIA of their recommendations, proving particularly incisive. As always, former Ferrari chief designer Rory Byrne, who headed the OWG, was extremely helpful and patiently explained the philosophy behind high, narrow rear wings and snow-shovel, adjustable (twice per lap) front aerofoils. He did not, though, indicate that the result of this high-speed collision between art and science would result in a grid full of Legoland F1 cars. In September, Magneti-Marelli, provided the WGV with an exclusive insight into its menu of customer KERS options, and, again the interview - with the managing director of the Italian company's motorsport affairs, Roberto Dalla - revealed just how difficult (and costly) it is to safely and efficiently recover 80-odd horsepower per lap, then release it to the road through the rear wheels via a sort of push-to-pass system. We await the 2009 opener with bated breath for a whole variety of reasons. The mutation of FOTA has been interesting to track, not least because the last thing FIA president Max Mosley would have imagined on July 3 when he issued his 'do-or-else' cost-cutting directive was that it would spark the formation of FOTA just three weeks later. Not in his wildest dreams could he have foreseen that the July 28 meeting in Maranello of the ten teams would result in Ferrari's Luca di Montezemolo, once a staunch FIA ally, being elected founder president of FOTA (nominated by, of all folk, Ron Dennis) or that John Howett, previously viewed as a committed corporate suit with no ambitions for high office in the sport, would be elected the Italian nobleman's deputy. In its short life, FOTA has achieved an enormous amount: first, it managed to stick together in the face of onslaughts from both the FIA and FOG; second, it squashed the crazy idea of single-spec engines for all by threatening a mass walkout. If the FIA's talk of identical engines differentiated merely by stick-on badges was a bargaining ploy, then it ranks right up there with rotating drivers in the silliness stakes; if not, it ranks three levels above. FOTA formed four working groups: a technical working group (with engine sub-group) under Brawn and BMW's Markus Duesmann respectively; a commercial working group shrewdly guided by Renault boss Flavio Briatore (co-partner with Ecclestone of Queens Park Rangers football club) and a sporting working group headed by McLaren's Martin Whitmarsh, which aims to totally revamp grands prix weekends. First-named group appears to be well on its way to formulating cost-effective regulations which preserve the essential DNA of F1, whilst FOTA has been rattling sabres as it seeks a better financial deal. FOG is, of course, vehemently resisting such demands on behalf of 63 per cent owner CVC partners and 8 per cent shareholder Bambino Trust (the Ecclestone vehicle) and the rest, including bankrupt Lehman Brothers (16 per cent), and simple arithmetic makes it is difficult to see how FOTA could derive additional revenues from the FOG pot. FOG's income has amounted to +$1bn for the past two years, and given that the 2008 MOU provided for 50 per cent of revenues to be shared amongst the teams (with an additional bonus of, in 2008, $80m accruing to Ferrari), approximately $600m per annum is accounted for. Add in interest payments of $230m on the $2.4bn loan taken out by CVC plus FOG's $170m annual operating costs and taxes, and very little change remains - certainly not enough to grant FOTA the additional $200m it is demanding. Tracking the Ferrari sweetener has been, to say the least, amusing, particularly as certain media outlets expressed surprise at its existence. Ferrari have for 20 years at least received results-linked bonuses on account of their historic status - but, as divulged in 2004 by Minardi's Paul Stoddart, this came out of the teams' share of +-27 per cent of total revenues. The MOU, though, provides for Ferrari's bonus to be paid from FOG's retained funds, thus no longer eating into the portion shared by the teams. Do they therefore really care about a side-deal cut with Ecclestone which eats into his revenues, not theirs? In addition, Ferrari was paid a one-off $100m golden handcuffs payment by Ecclestone in January 2005 at a time when the Italian team was cash-strapped in the wake of weakening dollar exchanges and plummeting FIAT car sales. This payment caused Ferrari to break ranks from the teams at the height of their then dispute with Ecclestone (over what else but money), and tied the Italian team to FOG until 2012. When the FIA's cost-cutting campaign was first floated, this column opined that (possibly) the main thrust behind the programme was to reduce teams' costs, not to save money or save them from themselves, but to ensure they had no reason to push for greater slices of FOG's income. After all, the viability of teams, and therefore their continued participation, depends on either reducing costs or increasing revenues (or a mix of both). Thus when the increasingly vocal demands by the teams for increased shares received short shrift from Ecclestone, who threatened to reduce their slice from 50 per cent to 30 per cent on account of the cost-saving measures recently forced through, a wry smile broke out in these quarters. But, if the WGV had mostly got it right in 2008, it certainly got it totally wrong when it came to Fernando Alonso's 2009 plans. A respected source swore that a deal, which would see Kimi Raikkonen retiring and the Spaniard slotting into the vacated red car via a greasing of Santander money, had been inked and it was a merely a matter of time before it was announced. As it turned out, that came to nought, for 2009, at least. But, who knows what Ferrari's future holds for Kimi and Ferdie? Certainly more than the Prancing Stallion holds now for Jean Todt, whose departure from executive office we prophesied over a year ago and were forced to retract. And, just this week the Alonso/Ferrari rumours started all over again. With that it is across to the crystal ball to work out precisely what 2009 will bring.